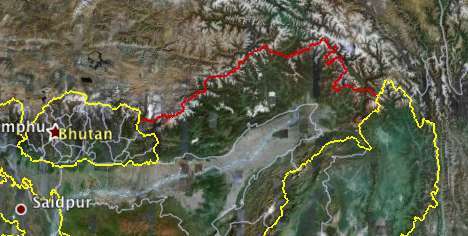 Just last Sunday, the Indian state of Arunachal Pradesh’s borders were the topic of debate here on Ogle Earth — and the educated guess was that a mistake had crept into the depiction of the border in Google Earth; namely, that an internal border was erroneously drawn as a national border. They also corrected Chile’s international and national borders! Especially important here: -49.5172º -73.3539º. “Map data @ 2007 DMapas/El Mercurio”, indicates the info was provided by the Chilean mapping company DMapas, which is apparently also providing info for Bolivia, Paraguay, Uruguay and Argentina. Did you notice they also rearranged the Layers panel? Do you guys know anything about DMapas/El Mercurio? El Mercurio is a large and very influential newspaper company in Chile. In its past and some would say its present, it has had a very ideological sway over its content and intervened quite directly in Chilean political affairs. Can you explain exactly what kind of information that DMapas/El Mercurio provides to Google? How did they screw up with this border info? It seems interesting to me what kind of conflicts of interest this would generate if any? The name is “Arunachal Pradesh” there is a L instead of an I at the end.